The Active Processor (ACPR) is an accurate, linear crossfader for either control voltages or audio signals. The new version designed by Serge in 2017 offers a widely increased precision. This module provides an important link in complex patches, allowing to smoothly change from one control voltage to another. It is possible to cross- fade between different envelopes, for example, or to gradually switch control over a bank of oscillators from one output of a sequencer to another output. The ACPR also offers interesting uses in the audio range, from wave- blending even to waveshaping (with CV in audio-range). 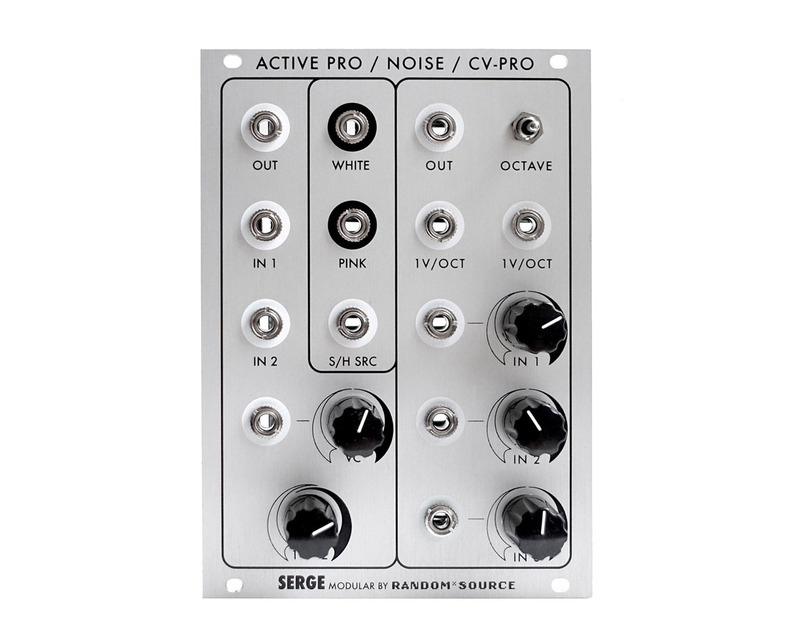 The Serge NOISE SOURCE (NOI) generates both white and pink noise waveforms. The S/H Source output pro- duces the necessary input for a sample and hold function to produce equi-probable random voltages, similar to a 1/F distribution function and is a perfect companion for the Smoothed & Stepped Generator (SSG). The Precision CV-Processor (CV-PRO) is also a new development that goes beyond adding and inverting control voltages. A precision input stage allows mixing 1V/ Oct voltages, e.g. to cent-accurately transpose sequences (i.e. stay in tune). A switch transposes precisely one octave up or down. The attenuverting stage offers full processing control of level and polarity of three inputs voltages includ- ing Serge’s unique diode-based wave-compression. This new version now allows using the non-linear attenuverter mixing stage with precise 1V/Oct (AUX) inputs without los- ing their precision. IN 1 is normalled to 5V and therefore can be used to add an DC offset when no input signal is present. The new version has been developed by Serge for and in close cooperation with Random*Source. The ANC is available as complete module or as a DIY kit (front panel and pcb, all SMT parts already installed - - DOES NOT CONTAIN POTS, KNOBS OR TH-PARTS).